I only made it to the last 25 minutes of Joel Beinin’s talk at SOAS last night but, sadly, I still have enough material to write a blog about it. Beinin’s talk, The New Internationalism, High-Risk Activism, and Popular Struggle against the Israeli Occupation in the West Bank, was chaired by Gilbert Achcar, who once publicly accused me of leaving insulting messages on his answering machine. Meanwhile, Beinin is Professor of Middle East History at Stanford University. Admittedly, I hadn’t heard of him but Wikipedia has a surprisingly large page about him. According to the description he was “raised as a Zionist” and at one stage intended to make aliyah but having encountered some racist attitudes on a Kibbutz he returned to America instead. Beinin has published a lot also. I only read one article of his when I got back last night but if I say that the article trashes Peter Beinart’s call for Israeli Jews living on the West Bank to be boycotted because this doesn’t go far enough you get the gist of Beinin’s politics. But, hey, guess who is the real master of “indecent trivialisation of the Holocaust”? None other than Joel Beinin himself! Oh, really? So would that be concentration camps like Auschwitz or Treblinka, possibly? But, of course, Beinin doesn’t indecently trivialise the Holocaust, remember. And all this because Beinin once encountered some racists on a Kibbutz? Jenny Tonge attacks Israel for not obeying the Ten Commandments. 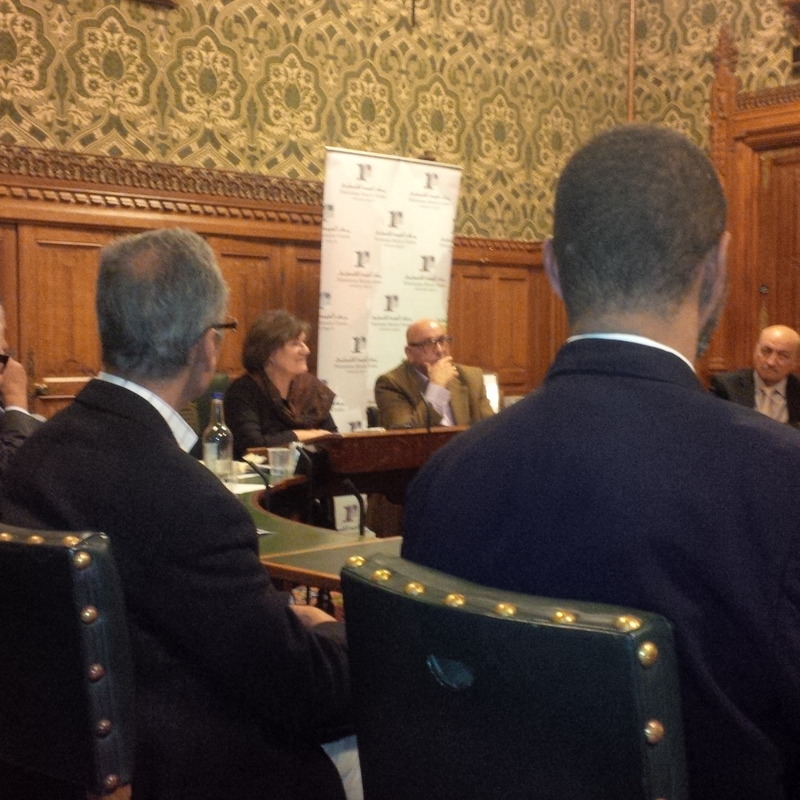 Baroness Tonge and Manuel Hassassian last night. 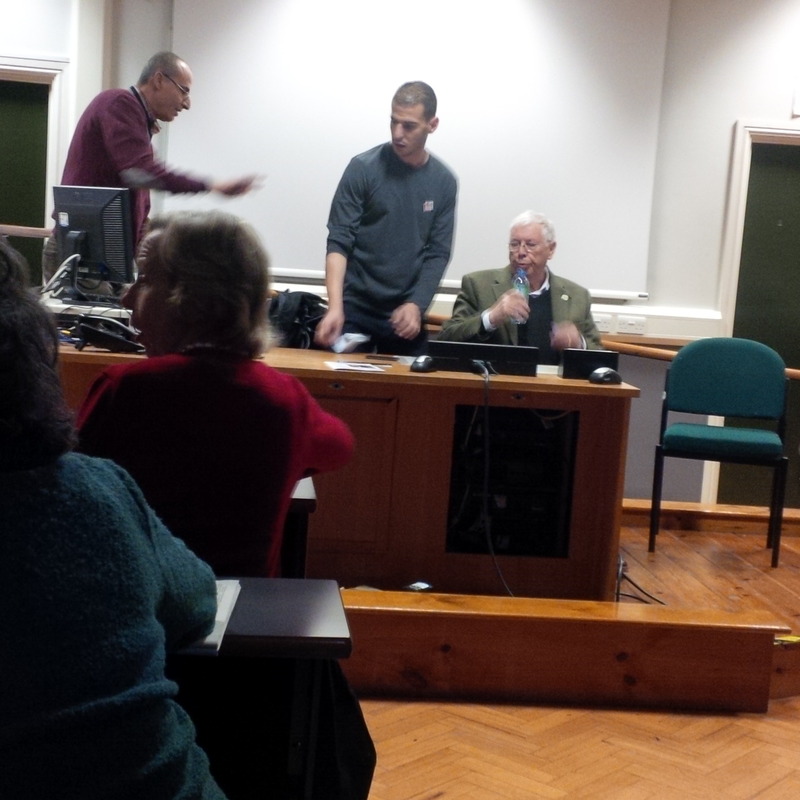 Tonge was speaking at the Palestine Return Centre event Britain, It’s Time To Apologize for the Balfour Declaration. Also speaking was Bradford East MP David Ward who in January condemned Jews who “could within a few years of liberation from the death camps, be inflicting atrocities on Palestinians in the new State of Israel and continue to do so on a daily basis in the West Bank and Gaza”. In July he tweeted that “the Zionists are losing the battle – how long can the apartheid State of Israel last?”. He was temporarily suspended from the Liberal Democrats. And last night he said “Israel are winning. We are losing hands down”. His main concern was that there is no proper plan to counteract this. But it’s certainly quite a change from his July claim “the Zionists are losing”! Also speaking was Lord Ahmed Nazir who was jailed in 2009 for dangerous driving where another road user died. Nazir then blamed his imprisonment on a Jewish conspiracy. Last night he claimed that “we have a great moral responsibility” and “a huge burden on our conscience” in light of the Balfour Declaration. “We must take on the pro-Israel lobby. We will not be silenced. We are not anti-Semitic, we are anti-injustice. What happened to the Palestinians is the greatest injustice in the last 100 years. They are clever. They call it the Jewish state of Israel so if you criticise the Jewish state they say you are criticising Jews and that you are anti-Semitic. But it is directed against the Israeli government, not the Jewish people. Many Jews join us. Manuel Hassassian, the Palestinian Authority’s diplomatic representative in the UK, condemned the Balfour Declaration. He said the Palestinians had been denied the right to self-determination and their basic human rights “due to the pledge by Great Britain to the Zionists”. He said the Palestinian “right of return” was a “sacred right” and that the “non-Judaisation of the state of Israel is our red line”. Hassassian continued by saying that Israel is acting as a “pariah state” and “let the Israelis go to hell” and that he would only negotiate with the Israelis when they had first drawn Israel’s borders for him. Meanwhile, if I was living in the Bradford East parliamentary constituency I would be flummoxed to see my MP David Ward spending a disproportionate amount of his time attacking Israel. Have the people of Bradford East had all their problems solved? The 2015 general election is not too far away and Ward has a tiny majority. Maybe it’s time for the people of Bradford East to elect someone who focuses more on them.